Baseball has been very good to me. It seems lately baseball has been kinda a thing around here. 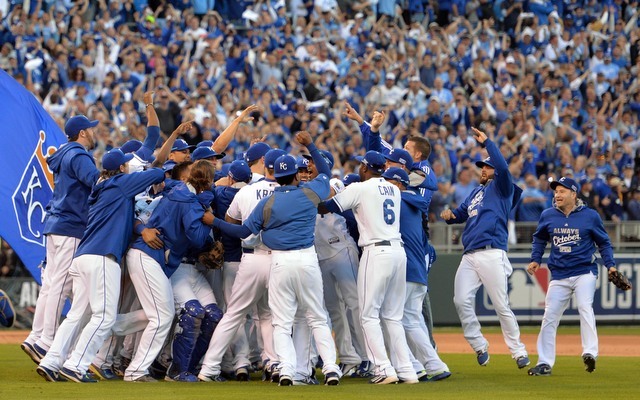 WE ARE IN THE WORLD SERIES, YA’LL. By “we” I mean MY team – The Royals. I am in no way a sports person. I claim this early in the post, unless you start thinking I am going to be able to provide batting averages or any other sort of technical talk about the team. I cannot, alas. But I can comment on a few other things, like how I think this video is the cutest thing I have ever seen. And how I really think the pitcher for that other team could benefit from a hair cut. That’s as good as it gets. But still, I really do love baseball. 1. As a kid, tired and dirty, coming home from our farm, we would listen to the game. Fred White was on the radio. I would slide around the back of the station wagon, sticking to the vinyls seats, no seat belt and look out the window and be lulled by the sounds of the game. We were all quiet. Tired. It is a sound from my childhood. 3. 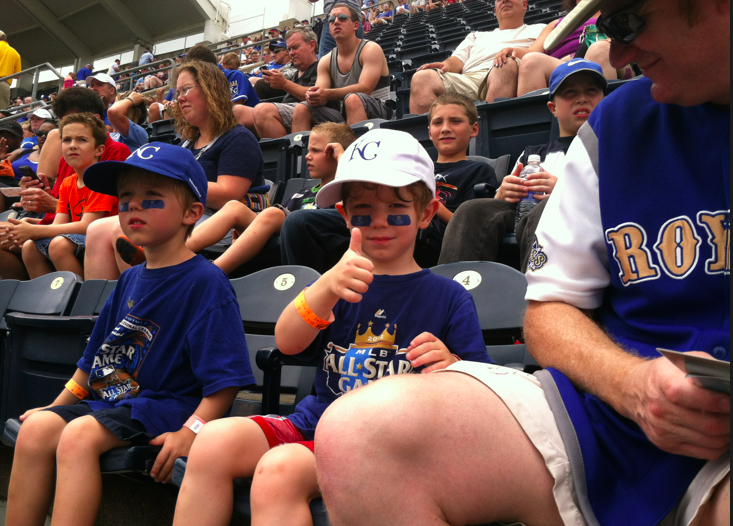 My boys’ first game. It rained the entire time. We had to leave finally, but not after we had become so wet my fingers were pruney. We ran to the car with puddles the size of the Grand Canyon. Somehow we survived, but for a minute there it felt like we were in our own Die Hard At the Royals Game movie. Awwwwsome. 4. And as for that first game – I can’t explain it. Watching the hubs lead the boys to their seats and show them the score card, like his mom did for him all those years ago… the hubs was in soggy, rain drenched heaven. Made my heart smile. 6. Watching my boys play IN a game. The first time Blonde got a hit at practice, he ran out and fielded the ball for the coach. Then ran to first. Very thorough. 7. Sitting with the other parents, watching the awesomeness that is toddler baseball, and just feeling joy. Simple, in-place, seated JOY. 8. Did I mention we were in the World Series? Every game, we sit and watch the television together, and my boys scream (often at totally wrong moments, but still, they’re trying) and we watch. Together. 9. And we eat hotdogs. You had to know that two of these numbers had to be dedicated to food, right? Hebrew National, you had me at hello. 10. There are no teams with black uniforms. This stems from a particularly traumatizing football game against the Raiders where blonde decided to start shouting, “Get da black guys! I don’t like the black guys! GET THEMMMMM!! !” This was unfortunate and so impossibly bad that my way of fixing it was simply to walk out of the room. Parenting win! And so, I love baseball. And if blonde’s fervor for the sport is any indication, I will be attending quite a few more games in my future, so loving it is good. I am hoping he will get past hitting AND fielding his own balls at some point. Both are excellent viewing! 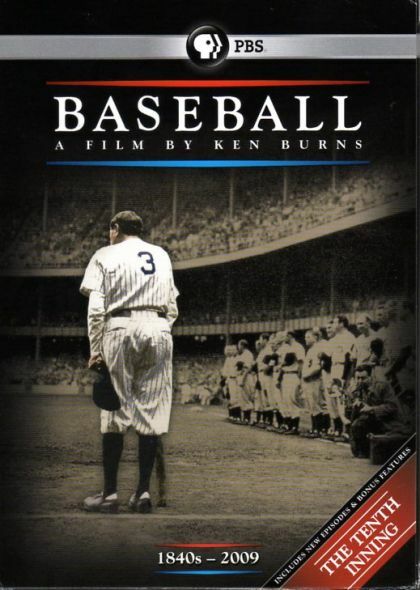 Ken Burn’s documentary has numerous celebrity interviews weighing in on how much they too love the game, and lots of history and rich background. 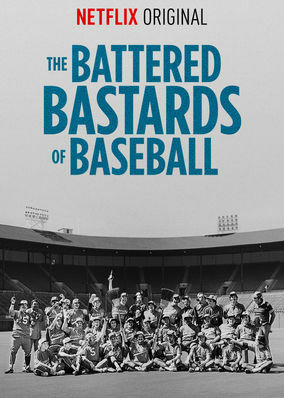 The Battered film (saucy language in the title and all) is my favorite, though. These guys are the real “Bad News Bears,” and their story is simply amazing. And rather hilarious. As for tonight? I will be watching a little game called: GAME THREE. WOOP! Previous Sure. You Go Ahead. Dance Like No One’s Watching, Kid. I loved this:) Thank you, Dana, for making me smile and chuckle (as I often do with your blogs)… even when I’m sitting alone in coffee shop. The Red Sox Fan/writer’s account of the 1986 World Series, where her kids try to cheer her up by saying they’ll win next year and she says she doesn’t know how to tell them “No, they won’t” is my favorite part. If only baseball were still as romantic. Alas money wins out and the Red Sox even won the World Series. Still, this has been such a fun summer. Here’s to hoping things turn around and I can enjoy taking my daughter to games too. Probably the thing about parenting I most look forward to is sharing those things it meant so much for my parents to share with me. Have you all been to the ball of twine yet? No ball of twine, but we HAVE been to Big Brutus – the huge crane… 🙂 it was awesome.